Unfished waters in Papa New Guinea Hello All from South Devon! January is proving to be a far better month for fishing that we would normally expect. The Whiting are still around and there are still enough Cod coming from the Chesil to make it worth whilst fishing for them. 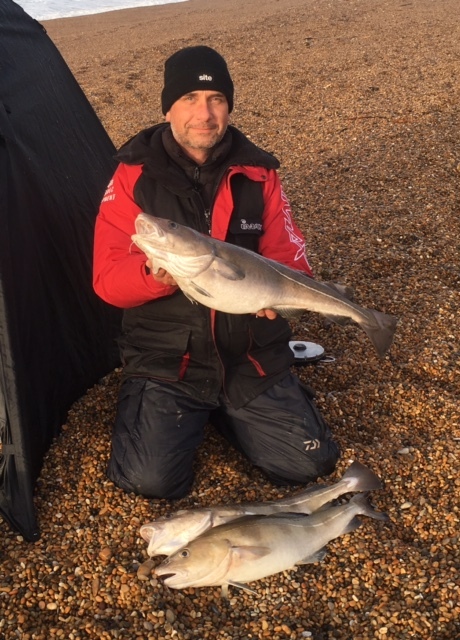 Mike Soanes who had a 12lb Cod on his last trip to Chesil travelled down from Plymouth on Friday night, to have another go. He had 3 Cod weighing 6lb, 7lb 2oz, and one of 8lb 12oz. Not bad for a last minute decision, due to a boat trip cancellation. Saturday night was not quite so good for the Cod. Darren Cramer caught the only Cod in the first of the Samalite league matches of the year, which was good enough for a section win. The water temperatures are above average and they don’t look like falling anytime soon. FIsh like Wrasse that normally head to deeper water in the winter are still in around in good numbers. Flounder were late in moving into Poole Harbour, but lots of them are being caught now. Holes Bay seems to be producing very well. We have plenty of articles again this week and the introduction of another new writer, Gareth Hopkins, who will be covering the Torbay area. Chesil Beach forecast: It looks like Chesil will be unfishable most of Tuesday until at least mid afternoon of Wednesday. Once it dies down a bit the fishing could be good, with the chance of one of the bigger Cod. You will almost certainly see Whitting, Pout and Dogfish, as well as the ever increasing number of Conger’s. Portland: Wrasse are still featuring in catches from the rocks. However like Chesil the West side will be unfishable for Tuesday and Wednesday. Portland Harbour: Still a few Bass in the harbour. One of my friends had a couple whilst targeting Flounder at Sandsfoot Castle. He also managed 4 Flounder. All were caught on Lugworm. Weymouth Bay: Whiting are being caught from both the harbour and Preston Beach. However the size seems to be getting smaller each week. If you fancy trying something a little different then how about some LRF fishing in Weymouth Harbour. A lot of anglers turn to this ultra light style of fishing to try and get some unusual species. Gobies, Blennies and Sea Scorpions normally make up the biggest percentage of the catch, but bonus fish such as Pollock and Bass can often be taken. One Response to "Good for January"
Cracking fishing Mike, whilst all around you where struggling! !